Having a diversified range of outdoor furniture and decorations that come as an accompaniment of the patio furniture, it can be hard to decide on the color of the furniture that you will use. Before coming up with any decision you should always ask yourself the following questions. Bright colors or natural materials? Sleek and _ modern or _ traditional? _ Oversized or _ subtle and refined? Color is brought about by various factors the first being consumer tastes, style and fashion. Color may differ for different patio furniture. Picking important pieces such as tables, chairs, storage and barbeques is a great step but also there are diminutive items and ornamental flourishes like cushions, umbrellas, plant pots and heaters. Depending on _ the state _ of the furniture be it new wood, _ old plastic _ painted metal, _ painted wood and also the type _ of paint _ chosen a _ variety of factors to need to be considered. Considering painting for wood furniture there are some of the things that need to be put in place. 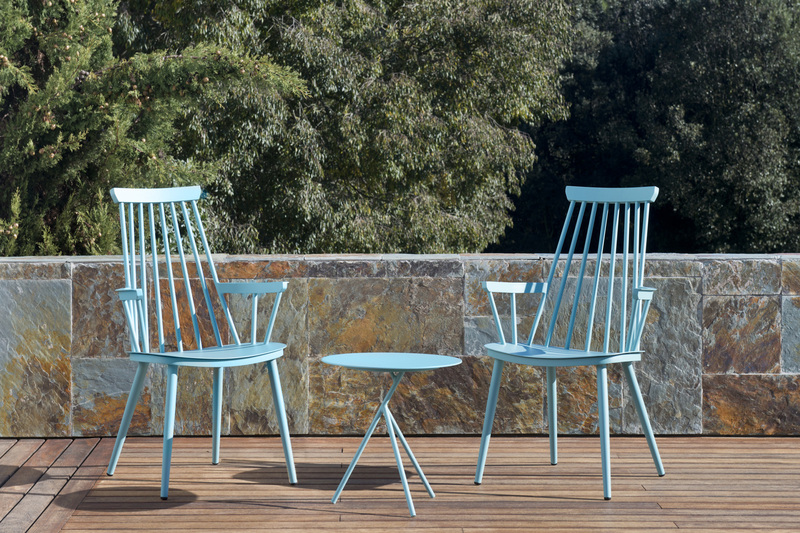 Painting outdoor furniture is aimed at ensuring that the wood is absolutely dry and free from mold and mildew which is something that needs to be checked prior for garden coffee tables, pool fold chairs, desks, garden sofa set and any other patio furniture. For an old surface or that which has mildew and mold, the surface should be properly prepared by using a premium cleaner to ensure that the furniture is well rinsed and allowed to dry thoroughly before using paint or stain. Air circulation also ensures that there is well-drying process before painting. Then sand the surfaces to be painted starting with the coarse-grade sandpaper, working with the grain and if the previous paint was old, then it can be completely removed before painting anew. Priming is usually the third step where after painting is carried out. One coat of stain would be enough but if the primer was skipped then a second coat is advisable. The paint should then be allowed to dry in a clean, dust-free, well -ventilated area. Painting for metal work may be somewhat different from that of wood patio furniture. The first step is to remove any pieces of rust by gently scrubbing off the big pieces. Then using a pal-sander to eliminate the rest of the rust. You can _ use sand by hand when you do not have a palm sander. After the scrubbing then ensure that the furniture is smooth to touch where it is cleaned with a solvent such as acetone to make sure that the chair is clean and ready for priming and later for painting. After painting it should be protected with a sealer and then let to dry. Plastic patio _ furniture should _ only have _ a paint specifically _ designed to _ adhere to _ plastic and _ hard –to-bond surfaces. For wicker or _ rattan, spray paints will tend to have nicer finishes and gets easily into the grooves. Paint produced primarily for metal _ surfaces tends _ to add _ rust protection _ into the paint and especially for rust proofing _ or rust inhibiting paints. Some paints have _ U.V _ protection in _ their paint and this helps to protect the finish to _ resist harsh _ weather conditions. Crucial factors in determining what color to go for include the backdrop, the color palette of your garden, the other objects in the shared space and the feel of the space. Backdrop means considering what is behind the furniture for one to decide on the color that will suit with that of the background. One may prefer to have a place to unwind and relax and this space may be where one wants to retreat from the chaos of the day, and have a quiet conversation therefore one should carefully choose the appropriate colors as they determine how you will feel. Black can be very classic or very modern while white tends to look a little washed out in the garden setting and comes across a beachy, post wedding and too bright. The trend also has a say in color preferences. Brights trend revolves around using strong, vibrant colors to bring a burst of color to the outdoor setting. Coastal trend creates a coastal theme using blue and grey colors and natural materials or unfinished timbers. Tropical look _ is easy _ to create _ with Bamboo, _ Wicker and _ Cane materials _ and _ green, _ charcoal and teal colors. Painting outdoor furniture pieces is an easy, fast way of transforming and update the look of your deck or yard.